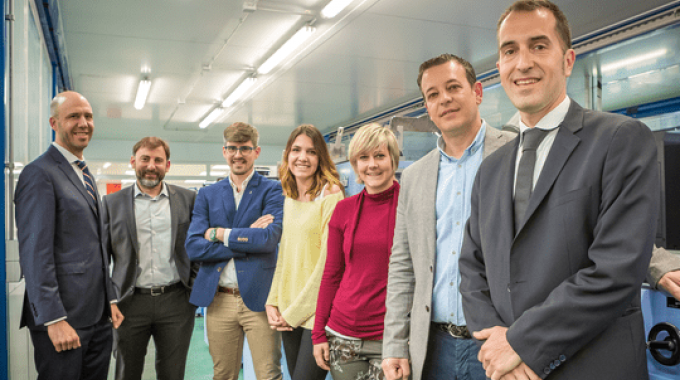 Spanish wine label producer Etilisa has installed a Miyakoshi MLP13C semi-rotary offset press to complement its HP Indigo digital press fleet. Founded in 2010 in Arnedo, Spain by Diego Castillo, Etilisa had previously produced self-adhesive labels for the Rioja wine region using digital printing. It has now added conventional press technology to offer a more rounded production portfolio. The machine chosen features five offset printing units and a flexo print unit to enhance the quality of metallic finishes. Castillo, Etilisa CEO, explained: ‘We are maintaining our essence and manufacturing philosophy 100 percent, and we have seen that offset technology is the natural, and indeed, necessary complement to our existing manufacturing structure, since it offers us the options of expanding our client base and of offering new products to our existing clients. Our main market, wine labels, demands a very high printing quality in medium length production runs, and offset technology allows us to respond to these demands. Once the decision was taken, the manufacturer and model best suited to Etilisa’s needs had to be selected. The MLP13C semi-rotary offset press has been supplied by OMC, Miyakoshi’s exclusive distributor for Spain. Castillo continued: ‘We are planning various steps. In the first place, and after the initial learning curve, since we have only had the machine for a few weeks, we will start modestly by getting orders from our long-standing clients, who have confidence in us. When this stage is consolidated, we will expand in our market, the wine industry, seeking larger orders and moving into other wine areas such as Rueda, Ribera del Duero, Toro or Cigales. Unlike La Rioja, where wine producers produce many different wines, wine producers in these other areas often produce only one wine, and this is especially true in Rueda, so where a producer in La Rioja might order 25,000 labels, in Rueda the order might be for 300,000. With the new semi-rotary offset printer, we are now ready for Rueda.